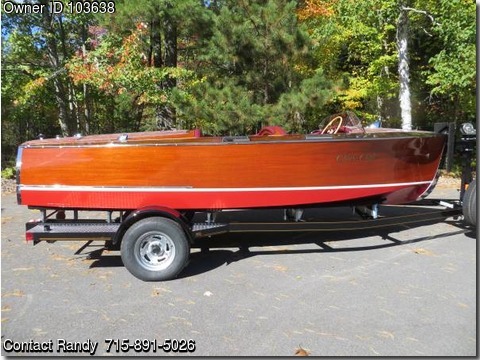 Boat is located in Three Lakes,WI.Please contact the owner @ 715-891-5026...For Sale: 1937 17' Chris Craft Deluxe Runabout(Hull #71041) on a brand new 4 bunk trailer with electric brakes and swing tongue. The boat has been restored from the keel up. A few deck and side frames are original, as well as the side boards, but everything else has been replaced. The bottom frames, keel, stem, gripe, and stringers are new. It has a double planked 3M 5200(no soak) bottom with new wood. Gauges have been restored, new steering wheel, all hardware re-chromed or replaced, new upholstery and new rub rail. The motor is a KL and has been completely rebuilt, as well as everything on it(i.e. distributor, carb, water pump, fuel pump, transmission, etc.). Pictures taken thru out the restoration process. This boat is in SHOW CONDITION!